A judge of an Owerri high court in Imo State has ordered MASSOB leader to be remanded in jail for disobeying the order of the court to appear before it. Founder of the Movement for the Actualisation of Sovereign State of Biafra, MASSOB, Chief Ralph Uwazuruike, has been sentenced to one month in prison by a judge of an Owerri high court in Imo State for disobeying the order of the court to appear in a case in which he is plaintiff. Presiding Justice Kemakolam Ojiako made the order in the civil case, HOW/265/2013, between Uwazuruike (plaintiff) and Barr. Chigozie Iheama and others over a land dispute. Ruling on the motion on notice filed on July 6, 2017, by C.K. Okorie, counsel to the defendant, praying the court to commit the plaintiff/contemnor to prison for disobeying the order of the court, Ojiako ruled that, “The plaintiff, Chief Raphael Uwazuruike, is hereby found guilty of contempt/disobedience to the said order of court made on April 2, 2017. Ojiako also restrained Uwazuruike, his agents, privies or servants from entering into the said land pending the determination of the action. The judge adjourned proceedings to July 10, 2018. 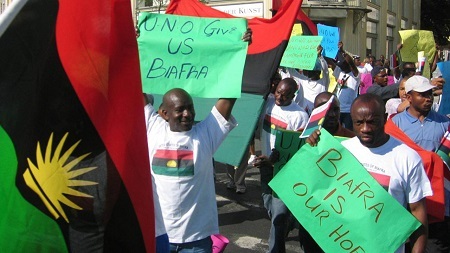 However, Emmanuel Chukwuka, counsel to the MASSOB/BIM leader, said that they had earlier appealed the contempt proceedings at the Appeal Court, which was slated for hearing on October 2, 2019, but the judge has continued with the contempt proceedings.